we have filed and registered numerous patents to gain a sufficient protection for intelectual property. professional support came from patent attorney Stefan Häckel from the patent law firm von Rohr in Essen Germany. For Stefans dedicated work we are very thankfull. patents in the EU USA and other countries pending. 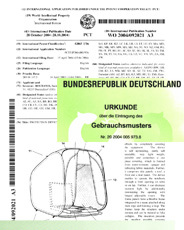 registered utility patent in Germany.